More About This Title It's Windy! This book breaks down concepts relating to what causes wind, as well as where certain winds blow and why they occur there. Readers will learn how the sun heats the earth unevenly, causing air pressure differences, or gradients, how the Coriolis effect influences wind patterns, how helpful winds spread pollen and turn turbines for wind power, and how scientists use anemometers, wind socks, and weather vanes to measure wind direction and speed. Chapters explain large wind systems such as Hadley, Ferrel, and Polar cells, trade winds, polar easterlies, prevailing westerlies, the intertropical convergence zone, the doldrums, and the horse latitudes. 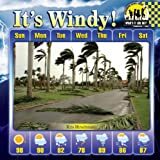 Monsoon winds, land and sea breezes, mountain breezes, Santa Ana and Chinook winds, wind shear’s effect on tornado formation, and how pressure differences and the Coriolis effect help hurricanes form are also discussed. Clear, helpful diagrams, full-color photographs, bold glossary words, and an index support this easy-to-read, engaging text.